We use black construction paper and instead of folding each collar tab at an angle, we fold them straight toward the middle and glue a white tab of paper in between them. Then we glue black buttons down the center. Using a white piece of paper attached inside, we write our message. As this Year of the Priest comes to a close, this project provides a nice way to let our priests know how much we appreciate all they do for us. 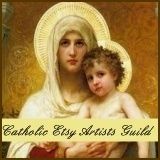 "We may or may not produce art with Catholic themes but are expressing our God given creativity through our art...[We] provide beauty and craftmaship in a world where commerce has lowered its standards and artistic value has been cheapened." Recently, I have had the opportunity to read Mary Gildersleeve's In His Image: Nurturing Creativity in the Heart of Your Home. Mrs. Gildersleeve's thesis states, and rightly so, that we have a natural desire and indeed an obligation to develop our own creativity in order that we may reflect to others The Creator in whose image and likeness we were made. Although we cannot create in God's terms, which is making something out of nothing, we can and should take the gifts and materials which He provides us and use them to bring beauty to the world. In His Image is an excellent explanation of this concept, one that can renew in us a desire to reveal God's beauty through our arts and crafts. Yesterday was the first of May, a month in Catholic tradition we dedicate to the Blessed Mother. The children in my house look forward to May Crowning all year-- especially my little girl, Gianna, who as eldest girl gets to place the crown of flowers on Our Lady's head. It was a gorgeous spring day, and we always say that Mary must make the tulips that bloom around her statue grow taller and more lovely year after year! and fruit of every kind. You provide the sower with seed and give bread to eat. may be fertile with abundant growth. will praise you unceasingly now and for ages unending.